An external trigger signal is often the only way to inform an instrument of the correct time to begin recording an event of interest. Many situations make transmission of the trigger signal by cable to the instrument virtually impossible. 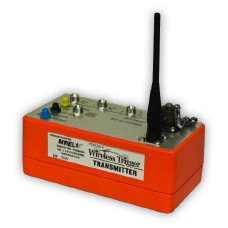 If you want to transmit trigger commands to your instrumentation either manually from your remote location, or automatically from the event being recorded, over long distances, or across difficult terrain, then the most practical triggering solution is the PWT™ Portable Wireless Trigger.